Helix-Piles – Arctic Foundations Inc.
Generally, Thermo Helix-Piles support greater loads than adfreeze piles. Shear loading in lieu of adfreeze allows higher unit stresses that equate to shorter embedment depths. 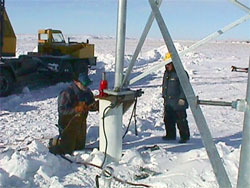 Thermo Helix-Piles are used when high transient loads are expected. The flexibility of the helix allows a more uniform load distribution along the pile. Thermo Helix-Piles are used to support structures where consequences of foundation movement are high. Thermo Helix-Piles offer high redundancy. Useable permafrost stress at helix diameter will be a minimum of twice the useable adfreeze stress at the pile diameter and is limited by the surrounding soil strength.